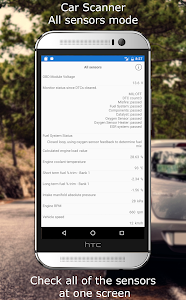 See what your car is doing in realtime, get OBD fault codes, car performance, sensor data and more! 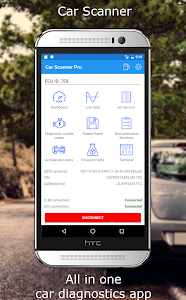 Car Scanner is a vehicle / car performance / trip computer / diagnostics tool and scanner that uses an OBD II Wi-Fi or Bluetooth adapter to connect to your OBD2 engine management / ECU. 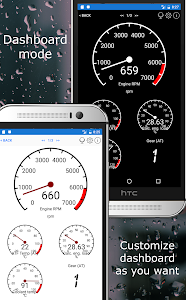 1) Layout your own dashboard with the gauges and charts you want! 2) Add custom (extended PIDs) and get information, that was hidden from you by car manufacturer! 3) It can also show and reset a DTC fault code like a scantool. Car Scanner includes a huge database of DTC codes descriptions. 4) Car Scanner allows you to read free-frames (sensors state when DTC is saved). 5) Now with Mode 06 - you can get ECU self-monitoring test results. Helps you fix your car and helps keep repair costs down! 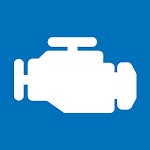 6) Check if your car is ready for emission tests. 8) Car Scanner works with any vehicle that uses the OBD 2 standard (most vehicles built after 2000, but can work for vehicles as far back as 1996, check carscanner.info for more details). 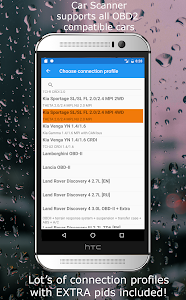 9) Car Scanner includes a lot of connection profiles, that gives you some extra features for Toyota, Mitsubishi, GM, Opel, Vauxhal, Chevrolet, Nissan, Infinity, Renault, Hyundai, Kia, Mazda Skyactiv, and others. 10) Car Scanner dashboard includes a HUD mode, that you can use to project data to your windshield. 12) Car Scanner can be used as a trip computer and can show you fuel consumption statistics! 13) And one more thing - Car Scanner provides the widest variety of features for FREE across the Play Market. 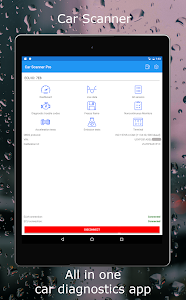 The app requires a Wi-Fi or Bluetooth OBD2 ELM327 compatible adapter to work. The adapter is small and plugs into the diagnostics socket on the car which gives your phone access. Recommended adapters brands: Viecar, V-Gate, Carista, LELink, Veepeak. If you buy one of the cheap china OBD2 ELM327 adapters from ebay / amazon, then make sure it’s not marked as v.2.1. This adapters are supported, but they have lot’s of bugs. PLEASE NOTE: Vehicle ECUs vary in the amount of sensors supported. This app can’t show you something, that is not provided by your car. Attention "bad" adapters! We faced the problem, that some adapters (often cheep Chinese clones), can’t connect to the smartphone or the car. Some of them can even make your car engine work unstable, often lost connection, increase time lag when reading data. So, we recommend you to use genuine ELM327 or recommended adapter brands. Similar to "Car Scanner ELM OBD2"